A new model for rheumatoid arthritis? The etiology and pathogenesis of rheumatoid arthritis (RA) remain a mystery, despite the efforts of many investigators over the past 40 years. RA at one time was labeled a 'collagen vascular disease', but the discovery of rheumatoid factor — an immunoglobulin M antibody that is specific for the Fc fragment of immunoglobulin G — sparked the idea that rheumatoid factor itself or other antibodies could represent the pathogenic effector mechanism. Experiments in the 1950s through the 1970s failed to substantiate this concept. The finding that rheumatoid factors were present in many chronic infections (malaria, subacute bacterial endocarditis), and the finding by Vaughan that transfer of large amounts of serum from patients with active RA failed to induce any disease in the recipients, was taken as evidence that antibodies did not represent major effector mechanisms in RA . In the 1970s, early studies by Stastny, and later studies by Gregersen, Winchester, and many others (see ) showed that patients with chronic, active, rheumatoid factor-positive RA had a striking increase in the incidence of the major histocompatibility complex (MHC) class II alleles human leukocyte antigen-DRB1*0401, -DRB1*0404, and -DRB1*0101. It became increasingly clear over the ensuing years that MHC class II molecules were responsible for positive and negative selection of CD4+ helper T cells in the thymus, and for the presentation of self and foreign peptide antigens to the CD4+ helper T-cell repertoire in the periphery. These two factors led many researchers in this field to entertain the concept that the pathogenic effector agent in RA was the CD4+ helper T cell. This concept gained support from early studies that showed that chronic thoracic duct drainage, with removal of the predominantly T-cell population in this fluid, resulted in a partial remission in patients with active RA . Many other findings - the response to immunosuppressive and cytotoxic agents, the prominence of CD4+ T cells in the mixed cellular infiltrate in the rheumatoid synovium, the increased expression of MHC class II molecules in this tissue, and other results - were taken as circumstantial evidence in support of the primacy of T cells in the pathogenesis of the synovitis and bony erosion in active RA. Further progress in this field has been stymied by the failure to identify a convincing target autoantigen(s) that is assumed to be the target of the CD4+ effector T cells. A number of animal models have been developed to study the role of several joint proteins as potential target antigens. These include arthritis induced by type II collagen, proteoglycan, human heat shock protein-60, and other antigens expressed in chondrocytes and macrophages under conditions of inflammation, such as human chondrocyte glycoprotein 39. Animal models that use these proteins to induce arthritis usually require complete Freund's adjuvant, are usually limited to one brief period of arthritis followed by inactive residual joint damage, and manifest varying degrees of requirement for CD4+ T cells and specific antibody to transfer disease into normal syngeneic recipients [4,5]. Most studies in patients with RA have reported a very low incidence (less than 25%) of either specific antibody or proliferative T-cell responses to these proteins [5,6]. More detailed studies , however, have shown that most patients with seropositive RA have synovial tissue B cells that actively secrete antibodies to type II collagen. In the light of more recent findings, these earlier studies perhaps deserve a second and closer look. In the absence of a closely parallel spontaneous animal model [such as the nonobese diabetic (NOD) mouse as a model for type I (insulin-dependent) diabetes mellitus in humans], and in the absence of a convincing target autoantigen, many researchers in this field have clung to the concept that CD4+ T cells are the prime effector mechanism that initiates the rheumatoid process, and the 'true autoantigen' has yet to be found. The recent demonstration that tumor necrosis factor (TNF)-α blockade, which exacerbates autoimmunity in the NOD mouse and the NZB × NZW F1 mouse, has a striking therapeutic effect in RA has been taken as evidence that the final common pathway in RA is macrophage activation, presumably triggered by cytokines released by activated T-helper-1 type CD4+ T cells. The possibility that autoantibody to a systemic self-antigen could also be a principal effector mechanism for initiation of the inflammatory process in the joint has been relegated to a distant second place, for many of the reasons noted above. Certainly, in my mind, autoantibody as a principal agent in initiating the synovitis and bony erosions seen in RA has not been given serious consideration. This prevailing paradigm must now be re-examined in the light of an elegant series of papers by the group of Benoist and Mathis, culminating in two recent reports in Arthritis and Rheumatism  and Science . These reports present convincing evidence that T-cell reactivity and autoantibody to a ubiquitous self-antigen, glucose-6-phosphate isomerase (GPI), are capable of inducing a disease with many features of RA. Most strikingly, arthritis can be transferred with serum or with purified antibody to the systemic autoantigen. The origins of this model are straightforward, but as with many phenomena in immunology, are somewhat complex in nature, arising as they do out of a serendipitous observation. The story begins with the production of a line of mice that are transgenic for a T-cell receptor (TCR) that was originally isolated from a T-cell clone specific for the bovine ribonuclease peptide residues 41-61, presented by the I-Ak MHC class II molecule. 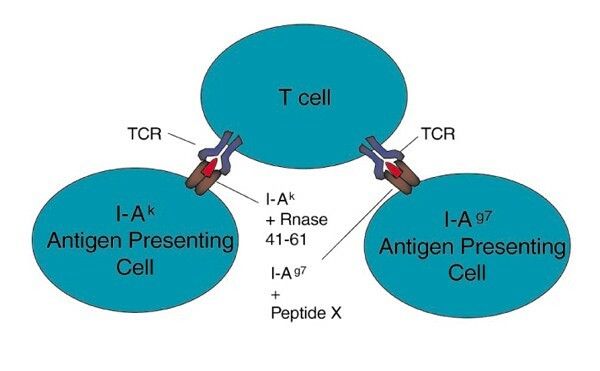 In the arcane lingo of immunologists, this TCR is said to be specific for ribonuclease 41-61 and restricted by the I-Ak molecule, resulting in the majority of T cells in the periphery expressing this TCR. In this transgenic mouse, however, the level of expression of the transgenic TCR in the periphery was low. In order to introduce a TCR α-chain-null mutation, Benoist and Mathis crossed their TCR transgenic with a NOD line, which was available in the laboratory and which carried this targeted recombinant. Completely unexpectedly, mice expressing the TCR transgene and the I-Ag7 molecule developed a severe arthritis, with rapid onset beginning at about 3 weeks of age. The arthritis observed in these mice has several similarities to RA, including the following: the arthritis is chronic, progressive, symmetric, and exhibits a distal to proximal gradient of severity; it is MHC class II allele specific; and is characterized by synovitis, pannus formation, and cartilage and bone destruction, with increased production of TNF-α and interleukin-6, and partial dependence on the action of TNF-α. Additional characteristics that are unlike RA are the great severity, rapid progression, distal interphalangeal joint involvement, occasional mild involvement of the spine, and complete absence of rheumatoid factor activity. Over the past 5 years, the group of Mathis and Benoist have executed an experimental tour de force, culminating in the two studies referred to above [8,9]. By a variety of crosses, including the introduction of an I-Ag7 β-chain transgene, they have demonstrated an absolute requirement for the presence of this MHC class II molecule for the development of the arthritic phenotype . Additional crosses involving several types of targeted recombination (knockout) mice have also established an absolute requirement for both T cells (expressing the transgenic TCR) and B cells in the spontaneous development of the disease . To explore this phenomenon further, the group of Benoist and Mathis  next carried out a series of experiments utilizing transfer of splenocytes, purified spleen CD4+ T cells, and purified B cells from arthritic donors into a variety of recipients, with and without the I-Ag7 molecule, and into a variety of recipients completely lacking their own T and B cells. These studies showed that an I-Ag7 restricted B-cell function, as well as the transgenic TCR, is critical for the development of the disease. The use of mouse lines expressing a restricted immunoglobulin repertoire (through the introduction of rearranged VDJ heavy chain and/or VJ light chain immunoglobulin gene segments 'knocked-in' to the germline) showed that, as the immunoglobulin repertoire became more and more restricted, arthritis development was delayed and, in the double heavy chain and light chain immunoglobulin transgenics, was completely eliminated. These results suggested that a specific B-cell product was required for the development of disease. Further studies (described in ) indicated that arthritis development required I-Ag7, and an I-Ag7 restricted, CD40-dependent, T cell-B cell interaction that occurred after the initial T cell stimulation. These results pointed to the possibility that immunoglobulins produced as a result of this interaction could be important effector molecules in the development of the arthritis. Serum transfer studies  clearly established the ability of serum from arthritic, transgenic TCR- and I-Ag7-positive donors to induce the rapid onset of arthritis in both healthy and B-cell-deficient or lymphocyte-deficient recipients. Further experiments quickly established that the immunoglobulin G fraction of serum was capable of inducing arthritis in both normal and immunodeficient recipients. Serum-transferred arthritis was transient, resolving in 15–30 days, but persistent active arthritis could be induced by repeated injections of serum from arthritic donors. Additional transfers showed that the most severe arthritis developed in recipients that still expressed the transgenic TCR, showing that the specific T cells can increase the severity of the disease, even at late stages. In the most recent studies [8,9] those investigators used serum from arthritic mice in immunoblots of tissue extracts from ankle, spleen, and kidney to show that this serum identified a 60-kDa protein that appears to be present in many different tissues. Purification of this 60-kDa protein, followed by trypsin digestion and amino acid sequencing of three of the tryptic peptides, revealed that all three peptide sequences were included in the amino acid sequence of a ubiquitous enzyme: GPI. The complementary DNA that encodes GPI was amplified by polymerase chain reaction, cloned, and placed in an Escherichia coli expression vector as a glutathione S-transferase (GST) fusion protein. This permitted the expression of GPI with the GST tag in E coli, and the construction of GPI-GST affinity columns, along with GST-only control columns. Using these columns, it was possible to show that all of the arthritogenic activity in arthritic donor serum was completely bound to the GPI-GST column, and that the flow-through immunoglobu-lins completely lacked the ability to transfer arthritis. These experiments establish beyond any doubt that antibodies to GPI are the arthritogenic immunoglobulins that are contained in serum from the transgenic, arthritic mice. Further studies  showed that these antibodies are first detected in the blood at low concentrations at 3 weeks after birth — the time of arthritis onset — and increase steadily until age 8–10 weeks. The authors then went on to show that the ribonuclease-specific, I-Ak-restricted, transgenic TCR is also specific for a peptide (as yet unidentified) from GPI when presented by I-Ag7. This situation is illustrated in Figure 1. Highly purified recombinant GPI presented by I-Ag7 antigen-presenting cells is capable of stimulating the transgenic Tcells to the same extent as the bovine ribonuclease peptide presented by I-Ak antigen-presenting cells . Thus, this remarkable series of experiments has established that a disease primarily localized to joints can develop as a result of linked T-cell and B-cell autoreactivity for a self-antigen that is ubiquitously expressed in the cytoplasm of all cells in the body . As the authors pointed out , arthritis does not occur as a result of other types of autoreactivity of this particular TCR. The same trans-genic TCR can also recognize an unknown self-peptide presented by an amino acid sequence variant of I-Ak. When this variant class II molecule is expressed in the TCR transgenic mice, however, there are no signs of joint pathology . This result implies that there are highly specific properties of the recognition of a GPI peptide by the transgenic TCR. There may also be important and specific properties of the antigen GPI. This protein is expressed in the cytoplasm of all cells, and is also detected in the circulation. It is therefore possible that the rare B cell with an antibody specific for GPI may capture and present peptides from this molecule to T cells with a high degree of efficiency . The antibody can then form complexes with the free GPI in the circulation, and this may be involved in the initiation of the arthritic process. Much remains to be studied in this model before it is completely understood, and before the implications of this model for RA can be formulated. First, the identification of the specific peptide from GPI that is recognized by the transgenic TCR in the context of I-Ag7 must be determined. The affinity and the off-rate of this peptide in its interaction with I-Ag7 will undoubtedly be studied, as will the affinity and off-rate of the transgenic TCR for the specific peptide-I-Ag7 complex. Additional functional characterization of the cytokines produced by T cells that express this receptor in response to cognate peptide-MHC ligand, and the susceptibility of this cytokine pattern to manipulation also need to be analyzed in detail. Numerous additional questions arise. Will immunization with GPI in either incomplete or complete Freund's adjuvant, with the induction of a diverse GPI-specific TCR repertoire, lead to the induction of arthritis and arthritic immunoglobulin G in I-Ag7 mice, or in mice with other MHC class II I-A alleles? These experiments would indirectly address several key questions concerning the nature of this autoantigen, and the nature and structure of the joint and the cells within the joint lining. Is there a unique property of this enzyme, or of other enzymes in the glycolytic pathway, that causes GPI and similar enzymes to localize to the joint? Does the subclass of the immunoglobulin G antibodies play a role in the development of the arthritis? Is this process dependent on expression of the stimulatory Fc receptors (FcRγ I and FcRγ III)? What is the role of complement in the arthritic process? Is there deposition of specific antibody, GPI, and components of the complement cascade? Benoist and Mathis point out  that there may be similarities between this model and the findings referred to in a review by Zvaifler in 1973 . It will be important to determine the localization of GPI, if any, in the normal joint and to enquire as to whether in the normal process of phagocytosis within the joint polymorphonuclear leuko-cytes extrude some of their intracellular enzymes during the course of phagocytosis within the joint, as suggested in the latter review . Is the access of either antibody or immune complexes to the joint space greater than access to other tissue sites, or to endothelial sites that might also induce local inflammation? Zvaifler  cited a number of electron microscopic studies of synovial and joint tissues in RA, showing considerable deposition of immunoglobulin and complement. Are such deposits present in the GPI-specific arthritis model? Benoist and Mathis  also noted several similarities between this model and the immune system-independent arthritis induced in mice by the expression of a human TNF transgene [13,14]. In this model, there is a high level of expression of human TNF in the synovial lining macrophages and fibroblasts. This finding underlines the importance of determining normal sites of expression of TNF in joint-related tissues, including synovial macrophages and subsynovial fibroblasts. As Benoist and Mathis pointed out , their model has many similarities to RA and is also dependent on TNF-α, in the sense that the severity of arthritis is much decreased in mice deficient in TNF receptor 1. Two of the most important similarities between this model and RA are the demonstration that susceptibility to both diseases is MHC class II allele specific and the arthritic process is, to a great degree, dependent upon the action of TNF-α. The striking new finding in this model is the prominent role of specific antibody to a systemic, ubiquitously expressed cytoplasmic self-antigen. Production of this antibody is clearly T-cell-dependent, but once produced the antibody can transfer arthritis to naïve recipients (albeit the most severe form of the disease is dependent on the presence of specific Tcells and specific B cells producing a specific antibody). Peptide X is an as yet unidentified peptide from glucose-6-phosphate isomerase (GPI). The T cell receptor (TCR) that is specific for ribonuclease (Rnase) 41-61 restricted to I-Ak manifests striking cross-reactivity to GPI peptide X presented by I-Ag7. As already noted, much more needs to be learned about this model before its implications for the further study of RA can be fully appreciated. New models always engender great enthusiasm on the part of some, and reluctant skepticism on the part of others. It seems clear that this is not a true model of RA. The disease is induced by a single transgenic TCR, whereas the disease in humans is, in all likelihood, due to the effect of a relatively diverse TCR repertoire. Although it needs to be ruled out, it is unlikely that GPI is a target autoantigen in RA. Nonetheless, several important points can be made. Whatever the next 5–10 years bring, Benoist, Mathis and their colleagues are to be congratulated on an elegant, precise, and impressive series of experiments. They constitute an outstanding example of one of Pasteur's favorite aphorisms: Dans le champs de l'observation, l'hasard ne favorise que les esprits prepareés (In scientific research, chance favors the prepared mind).